This is an interesting group which demonstrates the art of chasing a weak group of stones around to gain an overall advantage. The opening progresses more or less in an orderly fashion . . .
. . . until Black decides to invade with (move 17). White then decides to strengthen her stones before dealing with the invasion. For those not that familiar with san-san (3-3) invasions, would live if White decides to deal with it immediately. White builds an outside wall in exchange for a small living black group. (18) and (20) strengthen D-4 and E-3 enough that now dies. Blacks group on the right would have been able to make an eye with G-3 and been harder to kill, but then White would be able to kill . So Black lets White steal his eye at H-3 in exchange for (21) and (25). These allow to live, but now the right stones are eyeless. (H-1 goes away if White plays G-1). 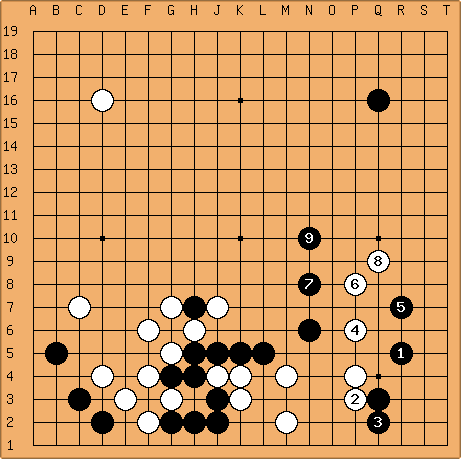 Blacks group on the left takes approximately 10 points from White and makes 10 points for Black. So it's value is approximately 20 points. 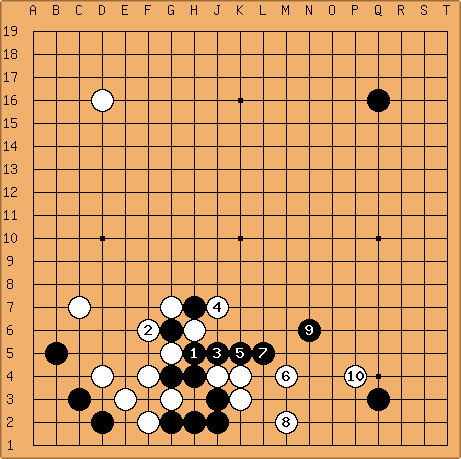 If Black decides to let the stones die, White gains maybe 16 points with a relatively strong group on the left. But the dead Black groups will have some aji which Black may be able to exploit later. Whether or not this exchange is good is open to interpretation. I would say that for me, I would be happy as White to give up the corner for Black's group. 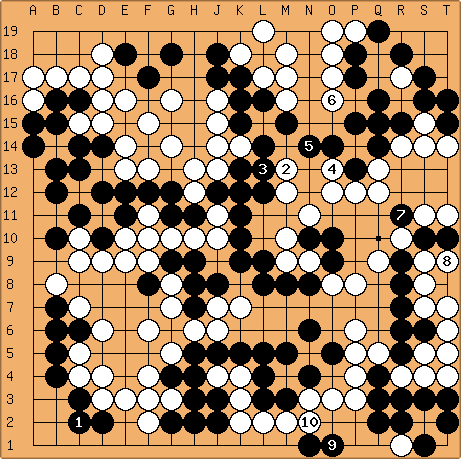 Compare the result with that of the standard joseki when a san-san invades a hoshi, and I believe it looks better for White. But instead Black decides that he wants to have his cake and eat it too. With (27) Black tries to escape with his eyeless heavy group. White begins the first round of the struggle ending with (40). On the left White makes a strong group which exerts influence on the left side and center. On the right White makes an ideal shape with K-4,K-3,M-2, M-4. With (40) I would say that White's group on the right is virtually alive. If Black expects to live by killing this, he will have to work very hard. Black goes running into the center. White prevents him from connecting up on right. Rich: It's worth noting that the upper half of the board is equal; in the lower half, Black has both corners and White really has only influence. This is a great example of how much damage a weak group can do to you, and how you can trust influence to come good later if you know how to use it. White peeps with . 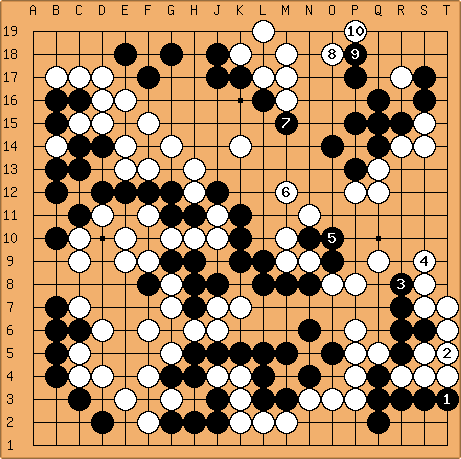 If Black connects, White will connect M-10 to J-7, and his influence on the left/center is even stronger. So instead of connecting, Black blocks the connection of White to the center stones. White then proceeds to take the center-right side, . . .
. . . and once again Black goes running. White blocks egress to the left. Black tries to split the blocking stone from safety . . .
. . . and fails. Black shift fronts and approaches the upper left corner. White responds conservatively. 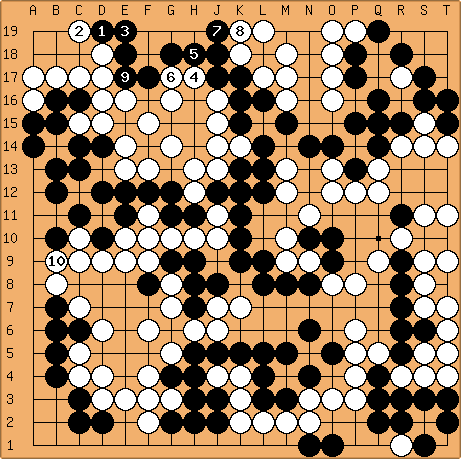 Black proceeds with a second kakari at (75). Observe that has a second purpose as a ladder breaking move (rescuing ). 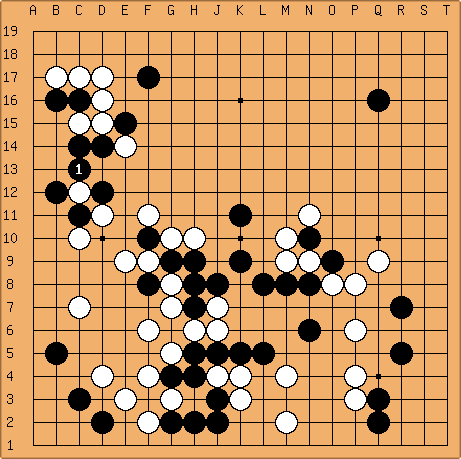 White responds with a pincer, which restores the ladder. 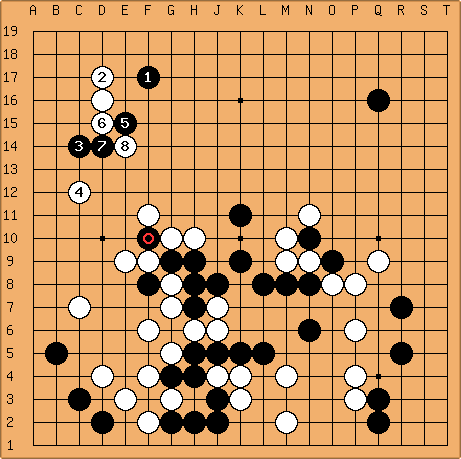 Black is forced to abandon his attempt to break the ladder and proceeds to attack the corner with a third "kakari". White proceeds to cut off the second from the third kakari. Black sacrifices two stones to get the side. White sacrifices the pincer to keep the cutting stone captured, and to get the corner. Black attempts to link his left group up with his center group. To do this he threatens to capture the cutting stone at E-14 and then sacrifices the stones at F-14 and E-15. White blocks successfully with H12, which can connect to either H-10 or J-14. Black tries to bull his way through, but fails. 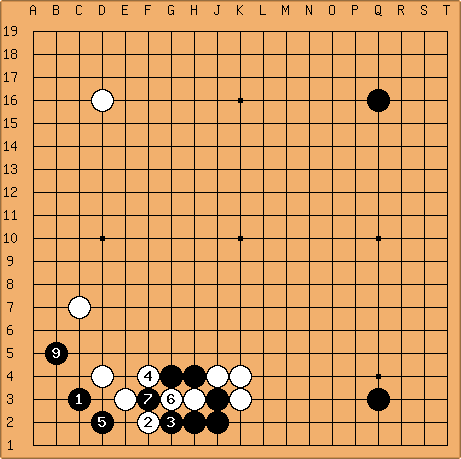 His left group cut off from the center Black moves to make it alive. White threatens to cut off L5 from L8. Black connects. 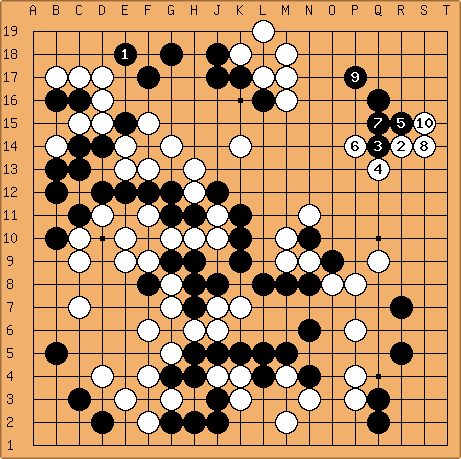 With K14 White moves to cutoff Black's center stones from the top. Faced with being surrounded Black tried to solidify his position on the bottom. 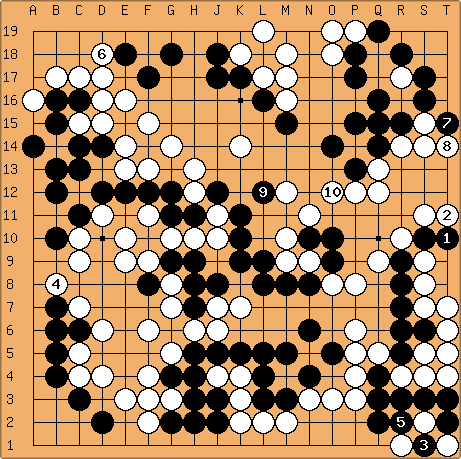 White then uses K14 stone to invade the top. Rich: It's getting worse and worse for black. Look at that poor hoshi stone in the top right. 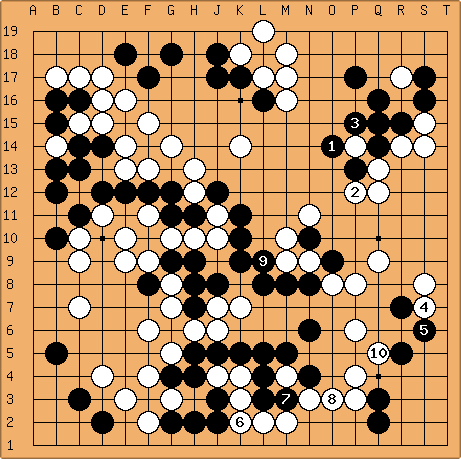 Andy: Seems here that black properly needed to fix up at rather than taking a few points in gote on the left with . This could also be a lesson about aji management. 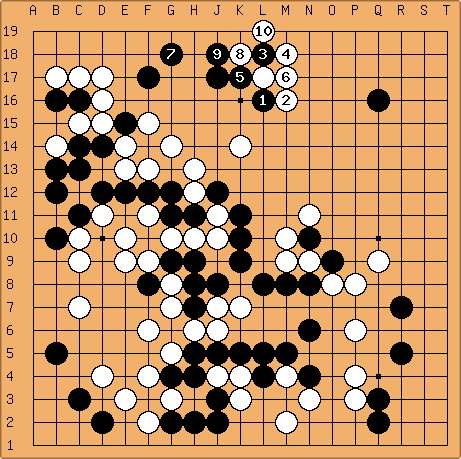 Rich: White uses the ko to take two big points, and ; black's lower right is going nowhere anyway. The points difference between getting the two points and the corner is not high, and they shore up weaknesses for later endgame moves. drop it in order to settle the board. 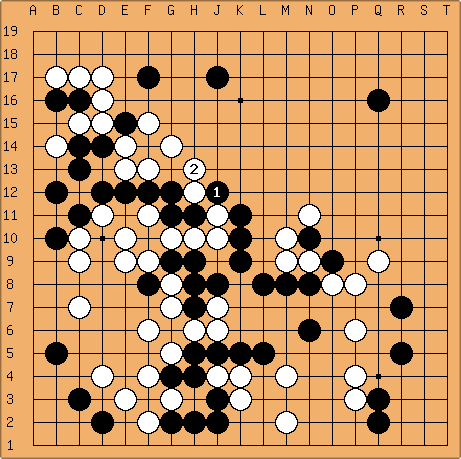 Black resigns. The most obvious comment: don't make Black's mistake. "Don't get greedy" is a basic rule of Go. Observe how the fight in the middle affects the rest of the game. With the exception of the S-7 group, every White group was influenced by Blacks struggle to save his group. The Black group lived. You don't have to kill a weak group to get an advantage. Despite the fact that Black lived, White did not let up on the group. It would have been easy for White to say "that's enough let Black live now". Instead White comes back to the well over and over. When it looks like Black can relax, White makes him work again. blocking escape to the left is another. The ladder blocking pincer at move 76 ( C-12 ) starts a series of double edged moves, one edge being an attack on the black group. 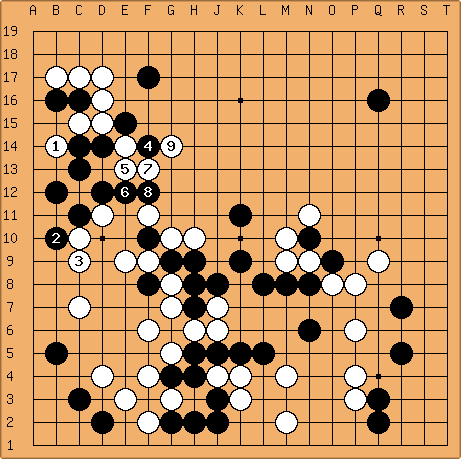 ( Even before that most of the moves were double edged. It is at this point where the double faceted nature become sharp. ) 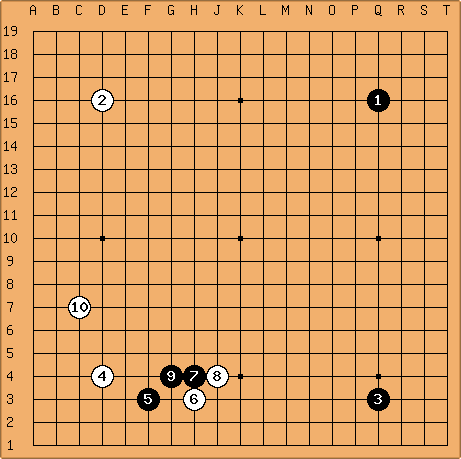 The combination of moves 116 (K-14) adn 120 (L-17) invading the top. unkx80: These are some very nice comments which all players should take note of. Excellent work! Rich: Agreed, a very nicely-picked example. And if Yaroslavna is who I believe, there are a lot worse people to study for good Shape. According to her KGS information, her full name is Yaroslavna Vandrovskaya.